Inside Scoop: This Loaded Vegetarian Poutine is keeping it real, and keeping it healthy. Have you ever had a vegan poutine before? Okay so truth be told I wasn’t very receptive to this idea at first, mostly because I love a classic poutine (Canadian over here, so makes sense right?). I love melted cheese curds, I love beef-based gravy, and it’s one of those very special meals, or side dishes, that I rarely ever have so when I choose to eat a classic Canadian-made poutine I use my intuitive eating forces and go all out. However, I saw a vegan poutine the other day and it looked really, quite good, and I thought to myself… I think I could make quite a tasty vegetarian poutine. I think I can I think I can (cue the little engine that could). So, using our Flavour-Packed Vegan & Gluten-free Mushroom Gravy and root vegetables I decided to whip up a vegetarian poutine, two ways. If you aren’t a vegan, and if you are okay with regular cheese, then this vegetarian poutine works wonders with regular cheese. I’m all about that mozzarella goat cheese, but gruyere or cheese curds work amazing with poutine. I decided to whip up both a vegan version, and a vegetarian version just to make sure they both worked nicely (mostly because I wanted a cheesy option and wanted to make sure that vegan cheese melted). I actually think I like the vegan version better, which is weird because I LOVE cheese. But I still finished both of these two poutines that you see in the picture here – not a word of a lie, so I think really, it’s up to you and your own style. 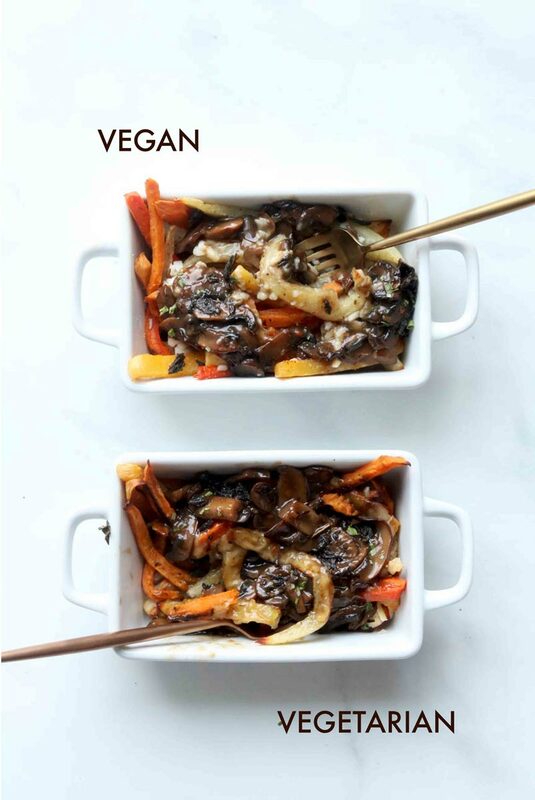 Dairy-free, vegan, okay with cheese – this veggie poutine was made to rock all dietary preferences. FYI, getting the right vegan cheese is crucial. I am not the biggest Daiya fan, and usually go for Earth Island Shredded cheese, which you can buy here. The mushroom gravy is key for this recipe, and also, so are root veggies. 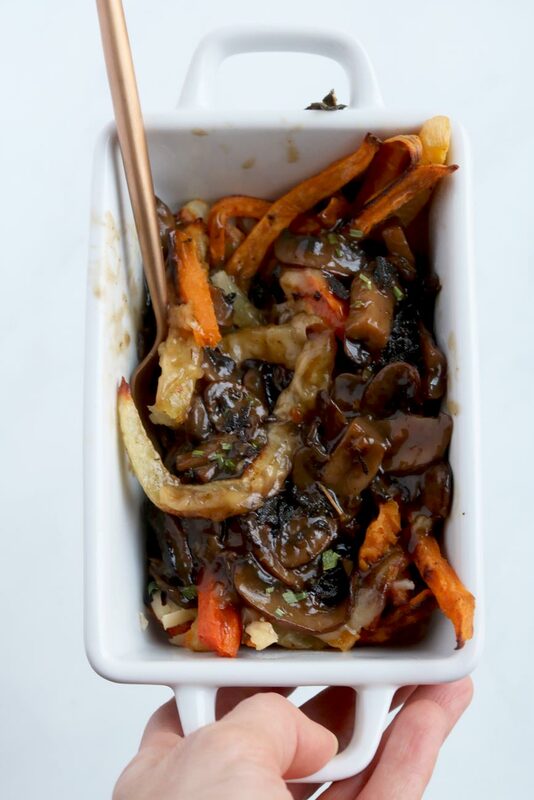 Especially because this gravy has a salty element to it, I like to sweeten up this vegetarian poutine by adding carrots, sweet potatoes and for this one I went all out and added half a rutabaga as well. 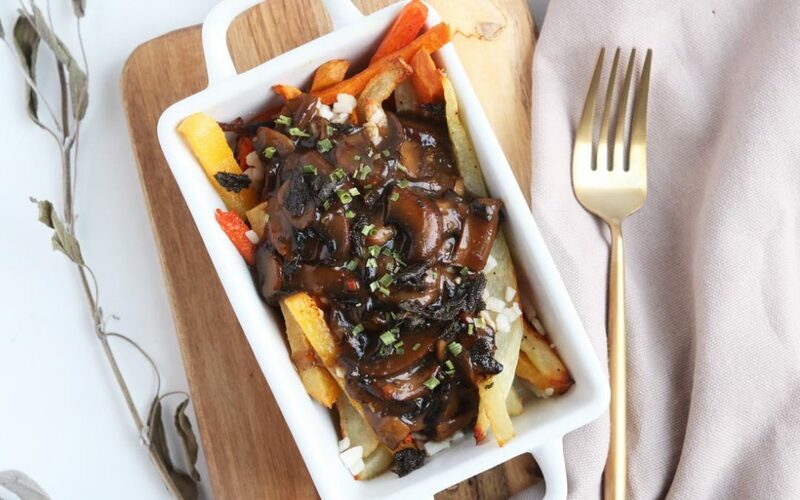 Use your imagination when it comes to this veggie poutine. You can do all potatoes if you like, but adding in a variety of root vegetables helps to ensure you are getting a lot of different nutrients in there. 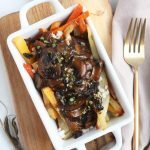 If you are a poutine lover, and looking for new and fun/ creative ways to get veggies into your life. 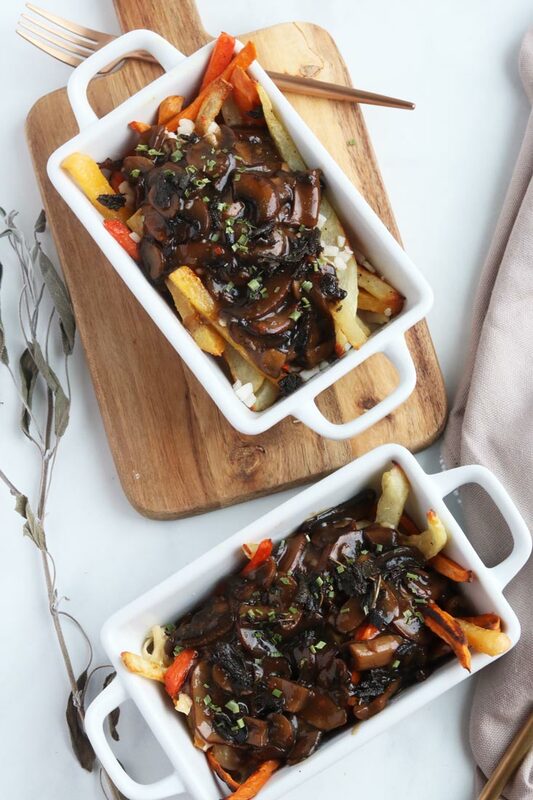 Or, all in all you just like switching your foods up and trying new things, this Vegetarian Poutine with Mushroom Gravy & Root Veggies is the perfect snack, lunch or go really big for dinner and make a large batch for the whole family. 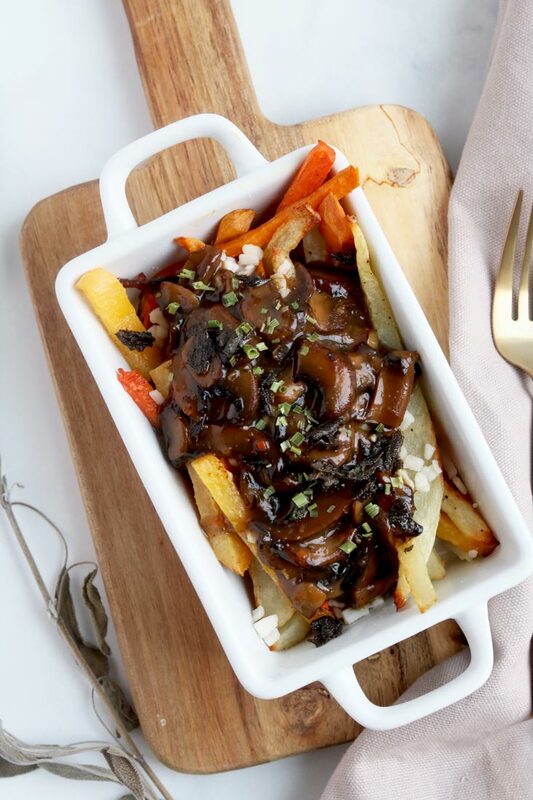 Do you think this vegetarian poutine is for you? *Nutrition information is for the poutine minus the gravy, please see this link for gravy nutrition facts, or check the back of any packaged gravy you buy. This Loaded Vegetarian Poutine is keeping it real, and keeping it healthy (vegan or vegetarian options). Cut the root veggies, and toss in oil, salt and pepper. Line a large baking try (you may need 2) with parchment paper and place the root veggies on the tray, be sure to not overcrowd. Bake for 30-35 minutes, flipping half way. Meanwhile prepare the mushroom gravy according to instructions (see above). Alternatively, you can buy a pre-packaged mushroom gravy – we left some links to our favourite healthy brands. Once everything is cooked, portion root veggies into separate bowls, drizzle ¼ cup of cheese on each, and top with apx. 1/3 cup mushroom gravy. Let sit 1 minute to melt. Keep it classic do all potato. Optional: fried sage, green onion, full-fat yogurt, cashew cream cheese, or use salsa and guacamole instead of gravy. Just wondering why the Nutrition Facts says 7% Cholesterol when it is a vegan version? Hi Philip, thank you! I think what’s happened on this nutritional fact label is that it’s picked up the values for goat cheese, since I have put the two options in there and the form doesn’t have an option for vegan cheese. I did use both varieties to test out flavour and the vegan version was pretty tasty. If you happen to use Earth Island shredded mozzarella there is 0% cholesterol.